Anyone can take a snapshot, a special photo is something else. There is more to it than just pressing the button. To create a special photo requires a combination of, a good composition, the right moment, the right camera settings, a surprising camera position and a clear point of interest, or subject. You’ll keep that special photo and relive the moment again and again. I’ll be telling you some of the ins & outs of photography through personal tuition during the workshop. Before you take a photo, it is important to determine what the subject is. Also think about how you can visualize the subject in a surprising or unusual way. In most cases, the subject must be in sharp focus. There are a number of methods and settings used to achieve this. Research what is possible and what works for you. The correct lighting is important for beautiful, bright and fresh colors. The exposure meter in the camera usually works well for this, but it is important to check the photo (exposure). Sometimes the shot is too light or too dark. You can adjust the exposure with the (+/-) exposure correction button. Then you can take a new photo with the correct exposure. Do not forget to reset the exposure compensation to 0. Besides the settings on the camera, the composition is also important for making a special photo. The rule of a third (the golden ratio) is a handy tool for making a good composition. 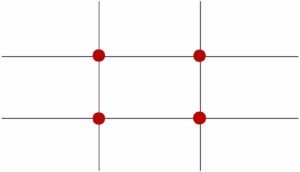 Divide the frame horizontally and vertically into three, in an imaginary way. Position your subject on a line, or at the intersection of 2 lines. This will quickly give you a harmonious, well-balanced composition . Pay attention to any distracting elements in your image and in the background.These unwanted elements can give a restlessness to the image, and they divert attention. You can make your photo series more interesting by making a combination of overview photos, and close up photos. Also, by using a wide angle and a telephoto lens. If you take a photo from a different viewpoint, this often gives a fresh look at the situation, and a surprisingly good photo. For example, a low (frog), or high (bird) perspective. Pay attention to your own safety, traffic, and your stuff, during the shooting. The right file format, L + small compression. The white balance (WB), usually the automatic white balance (AWB) is a good setting. Pay attention to the contrast difference in the subject, possibly flashing in the backlight. After taking a photo, it is wise to check the following points:Check the exposure using the overexposure indication, make sure that your subject is well-exposed. It may be that the background is slightly over-exposed. Check the sharpness of the picture by enlarging the image on the display. The subject must be sharp. You participate in the workshop at your own risk. Each participant must take responsibility for their own personal safety and property/belongings.